Ever get tired of cooking? Or maybe you live alone and don’t enjoy cooking for one? Here are 20 gift ideas for gluten-free cooks including useful and unusual kitchen gadgets, fun gifts for gluten-free kids in the kitchen, high-quality gluten-free ingredients and new gluten-free cookbooks for the cookbook addicts on your list. And all the gift ideas cost less than $20! Is your kitchen a gathering place? We have been asked about the safety of using agave syrup as low glycemic substitute for cane sugar. Here is some useful information. Allergy Eats Answers! New Press Release on Traveling With Food Allergies. BOSTON, MA (March 19, 2012) – Millions of people will travel this season for spring break, school vacation and the Easter/Passover holidays, and for most of them, these trips mean fun, relaxation and wonderful adventures. But for the 15 million people with food allergies (and their families), traveling can be a source of tremendous anxiety. Dining in unfamiliar cities and restaurants – which may or may not be able to accommodate their special dietary requirements – can be extremely stressful. Worrying about a possible allergic reaction compounds the problem. But the food allergy community can depend on AllergyEats (www.allergyeats.com), the biggest and fastest growing source for finding allergy-friendly restaurants, to help them more comfortably dine out wherever they are – resulting in a more enjoyable, less stressful trip. Do gluten-free diets put people at a higher risk for excessive and dangerous exposure to inorganic arsenic, a known carcinogen? It depends on the food choices you make and how much, and what variety of rice you eat. In their ongoing analysis of arsenic in our food supply, Consumer Reports researchers analyzed 223 samples of rice and rice based products typically found at grocery stores in the U.S. Consumer Reports is a non-profit, independent consumer safety organization founded in 1936. The results of Consumer Reports magazine analysis were recently published in the November 2012 issue, Arsenic in Your Food. Virtually all rice products tested contained arsenic, from low levels to potentially toxic levels. On a recent visit to a museum, my husband and I stopped at its cafeteria for a snack. The choices were cookies and cupcakes, pretzels and potato chips, and assorted drinks. Clearly, the cafeteria didn’t cater to those of us who are gluten-sensitive, lactose-intolerant, and/or weight watchers. Coconut Butter and Coconut Oil – What’s the Difference? I’ve only recently started using coconut butter in my raw foods recipes, but I’ve used coconut oil for years. It took me a while to figure out what the coconut butter hype was about, because I thought that coconut butter and coconut oil were the same thing. They are NOT. They are drastically different and yield different results when making raw foods. I first became introduced to coconut oil when I purchased the BabycakesNYC cookbook. Not only does coconut have a great flavor, but it’s a great substitute to make egg-free french toast and easily substitutes in exchange for canola oil when baking. 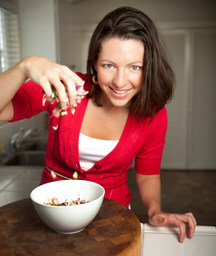 While I am no nutrition expert, I’m a nutrition guru, who loves to learn about the health benefits of different foods. After all, you are what you eat, right? Do You Make Your Own Gluten-free Bread? I have often wondered what percentage of people following the gluten-free diet actually make their own bread. I tend to use mixes to make sweet breads, but I usually buy my gluten-free bread off the shelf, or from my favorite local gluten-free bakery Pure Knead. Most of us know that gluten-free bread has come a long way in the last five years, so there are a number of great options to be purchased at local health foods stores that don’t contain artificial ingredients and have the taste and texture of wheat-based bread.